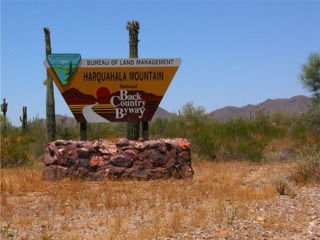 click photo to enlarge As the sign says the road goes to the Harquahala Mountain and the BLM has made it a scenic Back Country Byway. Harquahala Mountain is the highest point in Southwest Arizona. 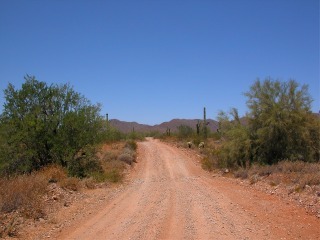 click photo to enlarge The road starts off pretty smooth and not much gain in elevation. The round trip is 21 miles. 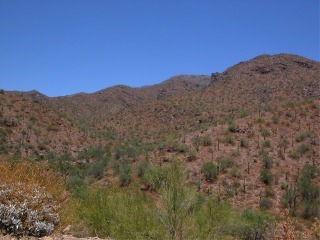 click photo to enlarge But after 5 or 6 miles it starts to get a bit more rugged. 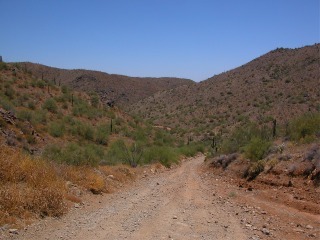 The day we went it was 104 degrees. 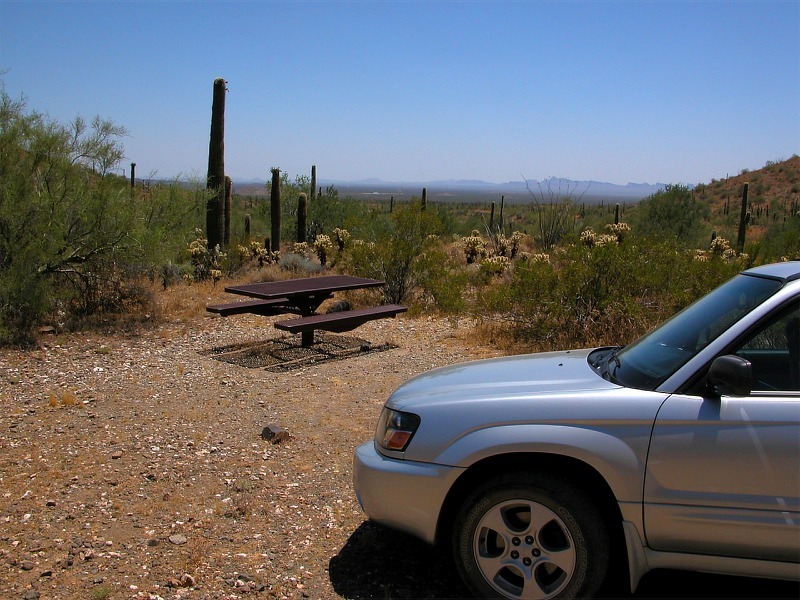 In fact the road got so steep the Subaru temperature gage started going up fast. It was going up so quickly I had to stop and turn around. We never made the summit. It didn't make sense to push it and breakdown in this kind of heat this far away from civilization. click photo to enlarge We stopped here for lunch. There were picnic tables along the road that were actually camp sites. The view from this little spot was very pretty. 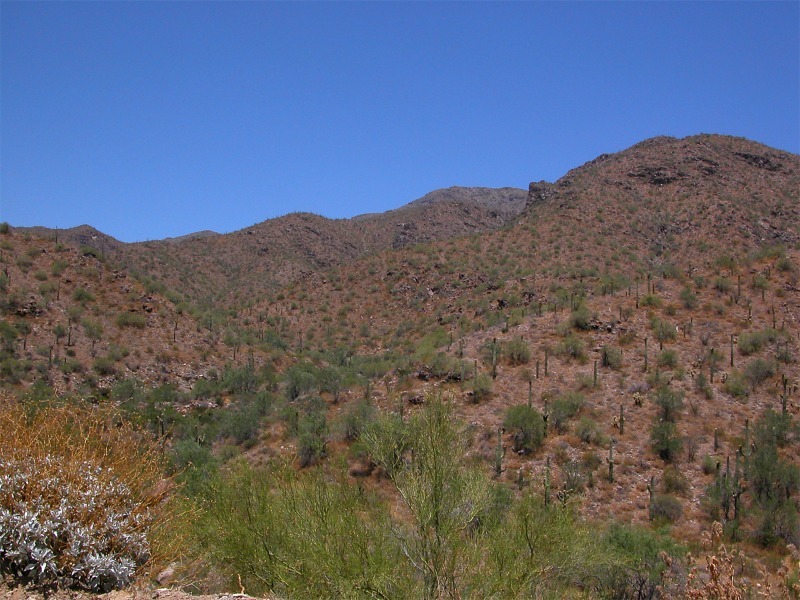 click photo to enlarge The scenery was definitely Sonoran Desert. At the top of the Mountain is a solar observatory build in the 1920's by the Smithsonian. We'll have to try this again in cooler weather.